I tried on a few items at LOFT the other night when they weren’t on sale. For size reference I’m 5′ 2.5″, currently 108-110 pounds and I’m usually size XS petite in tops and 0/25 petite in pants and jeans if an item runs true to LOFT sizing. If you’re new to my blog I typically share the link to a short video clip below each still image. It’s the same video clip I sometimes share to my Instagram stories. I’ve also been updating Pinterest for those that prefer a more visual catalog of my reviews. 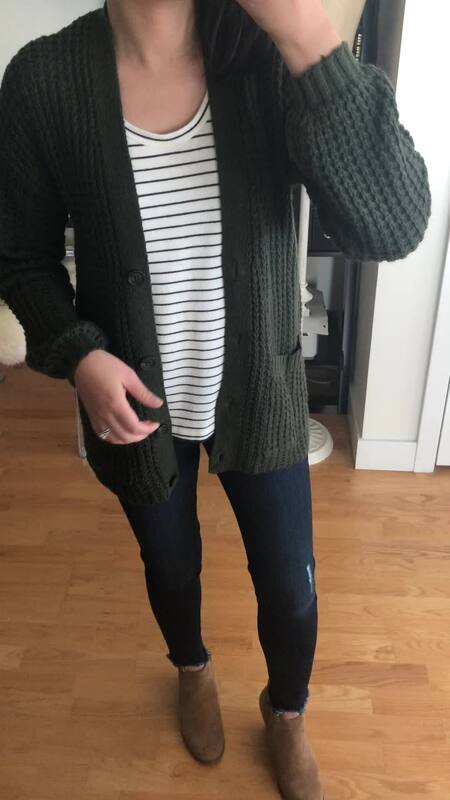 This drapey cardigan fits true to size and it’s on my wish list. 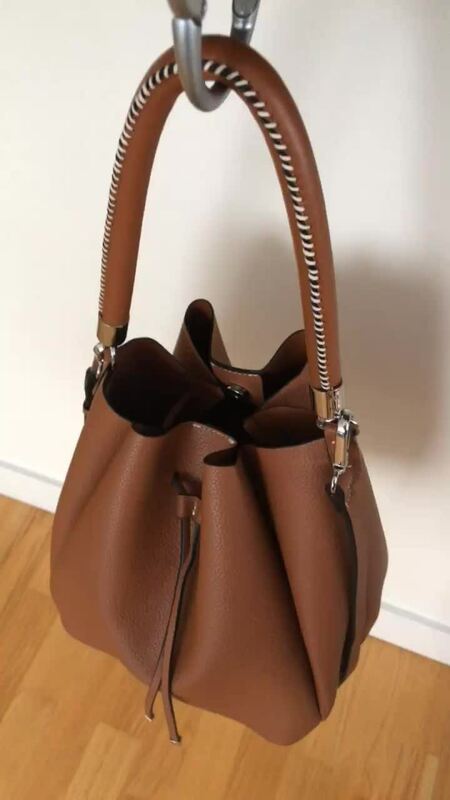 I wanted the taupe and the black color but only the taupe color is available for pick up in store so I couldn’t use the code APR441LC for an extra $25 off $75+ (click here for the in store bar code). It fits true to size but the sleeves are close fitting although not too snug. The material contains 26% wool. I also wanted to pick up the lacy pointelle sweater in grey but it also isn’t available for pick up in stores except in the muted mocha melange color I reviewed below. 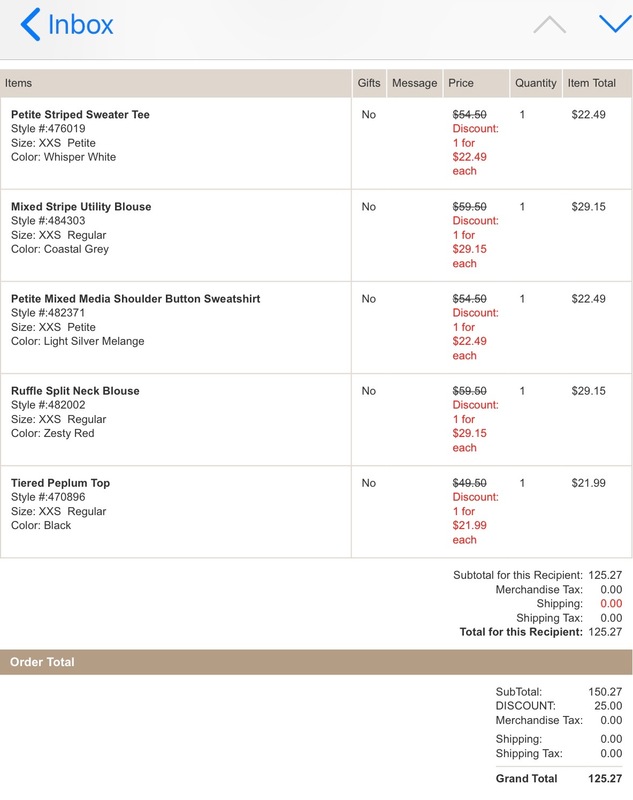 For now I ordered two full-price tops on my wish list along with a few sale items so that I could take advantage of the stackable code for extra savings. With the combined discounts (30% off full-price tops & sweaters + $25 off $75+ with code APR441LC) I got both of the new tops for $29.15 which is 51% off retail. If you’re deciding whether to shop now or later the next LOFT Friends & Family sale for 40% off will be next week. Last year’s sale started with 40% off but then it was upgraded to 50% off per this blog post. It’s too soon to know if LOFT will do the same upgrade as last year but it probably depends on how the sale does the first few days. I’m saving my $40 in LOFT rewards to use on something where I know I won’t be returning any items due to the fit/sizing. I’m still unsure what happens to my rewards if I used them towards an order but have to do a partial return. If anyone has a definitive answer on this please share in the comments below. 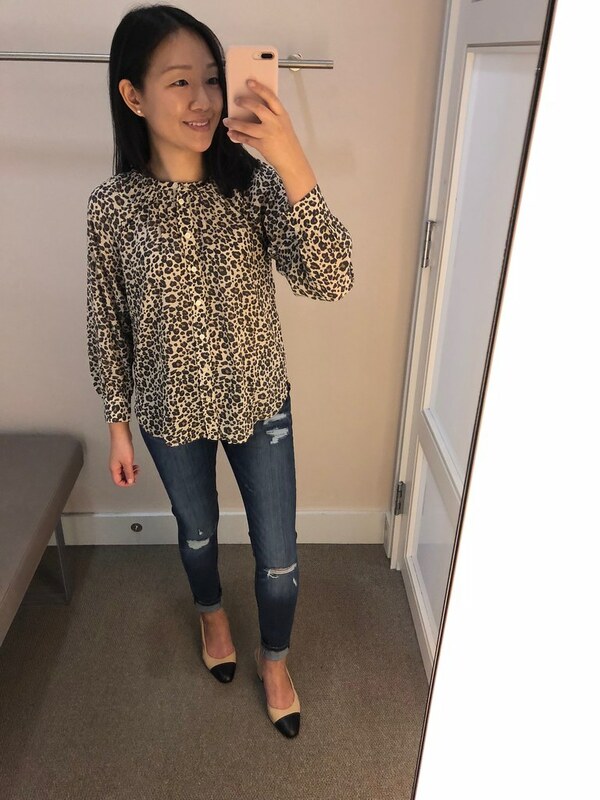 This leopard print blouse looked so cute online but when I tried on my usual size XSP it was an awkward fit. The button down placket kept on moving off to the side instead of staying in the middle. The sleeves were also very short and based on where it hits my arms the sleeves are probably 18″ or shorter. I would need to try it in size XXS regular which is an online only size to see if the extra length would help with the sleeve length. Note that the color is more muted in person. This sweater is a edited version of last year’s pointelle sweater (review here and here). I took size SP last year and this year’s version isn’t as loose fitting through the body in size SP. 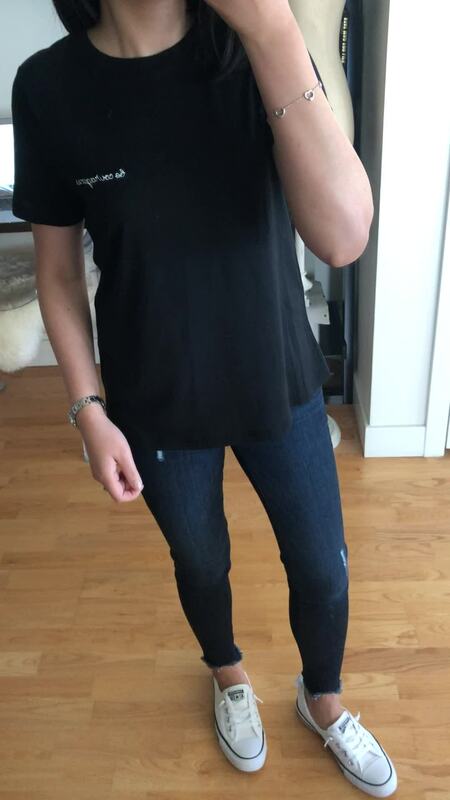 I prefer the relaxed fit by sizing up but I haven’t tried on other sizes for comparison. I really want to see the light grey color but it looks like I would have to order it online. I tried on this cowl neck tunic sweater in size XXSP last year here but the fit was all wrong. Size XSP is very loose on me so I need to try on size XXSP to compare (hopefully this weekend). I’m hoping the body isn’t a snug as last year’s version. I’m pretty sure I’ve reviewed these distressed jeans before but I noticed that they changed the name of the jeans online. The busted holes at the knees hit below my knee caps and the length is slightly longer so I prefer these cuffed once. In any case, this style is more distressed than I prefer and I actually ordered this pair I reviewed here from Banana Republic which look and fit different than the online stock image. Stripe Utility Blouse – I reviewed sizes XSP and XXS regular here last year. I ended up selling the red and white stripes but I love that it’s back in a classic black and white stripes this season. Hooded Pocket Open Cardigan – LOFT has brought back this popular hoodie every year since late 2014/2015, 2016 and last year. Every year they make slight adjustments to the pockets and the hem. Striped Tie Cuff Sweater – I got this sweater last year (review here) and it’s back this year in grey and black stripes. There were also a lot of new arrivals this week! I got this bag clip to use since I wanted to have a way to hang my bag instead of sharing a seat with my purse or holding my purse while eating if there’s no other place for it. So far I have only tested it with 5 pounds worth of contents but it’s been convenient to whip it out and use on any place with a ledge/edge. I would be wary of the surface you use it on because the end of the clip may mark the surface especially if the contents of your bag are heavy. The clip supposedly holds up to 30 pounds. I haven’t purchased anything from American Eagle in years but this mini haul was influenced by my friend Ly. I was curious about the quality since I’ve noticed a few bloggers sharing cute sweaters from them. I wanted this sweater in the ivory color but it was sold out in XXS but after ordering XXS in the olive color I believe I would prefer the more oversized fit of size XS. This sweater is soft and not itchy but likely prone to easily snag due to the looser weave. Also similar to Ann Taylor, Aerie also provides free 2-day shipping through ShopRunner. 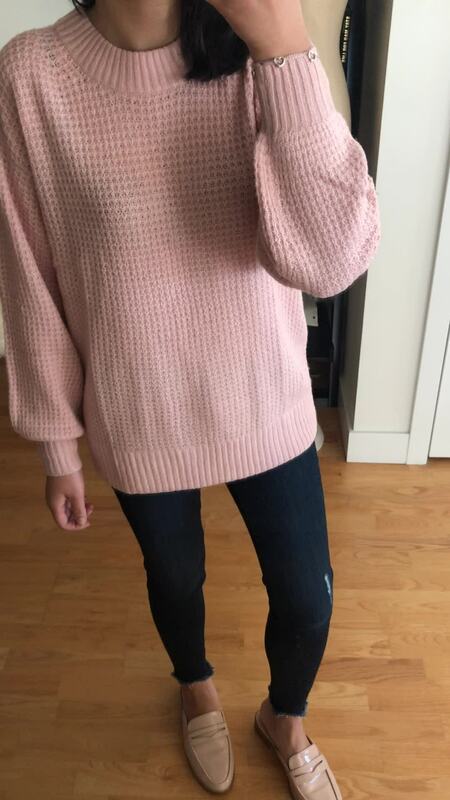 I also ordered this blush sweater since the color online looked more like a like powder pink online but in person it’s a shade of pink I don’t love. Size XXS is an oversized fit on me but it’s still cute and it comes in a lot of other colors. Similar to the cardigan this sweater is soft and not itchy. It’s thin enough that the outline of my black bra could be seen through the looser weave. 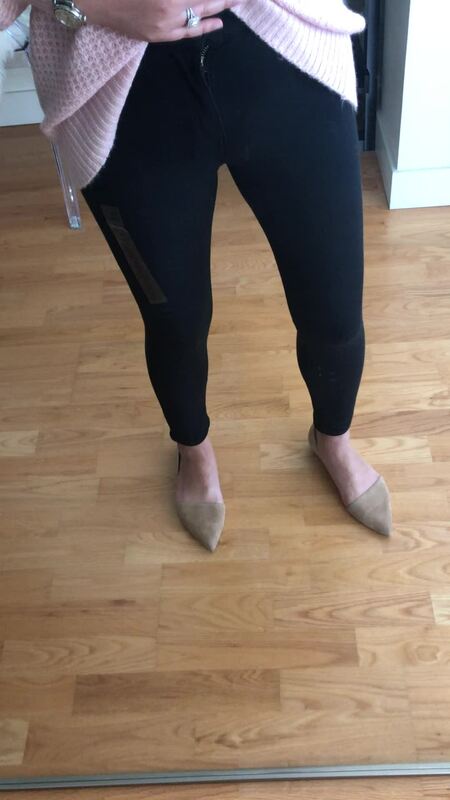 My friend recommended some seamless underwear from Aerie (when they arrived size XXS looked like they were meant for a child but they surprisingly stretch to fit) and she also recommended that I try these black jeggings. Size 0 x-short measurements are: 26.5″ waist, 8.75″ rise, 23.5″ inseam, 9″ ankle opening. The material of this pair is thinner and they are not as pigmented, smooth and snug as the LOFT leggings (review and measurements here) that I’ve been favoring lately. The 26.5″ waist is a bit snug on me but I think size 2 x-short would definitely be too loose through the legs. I blame late night Instagram browsing for making me go off on a shopping tangent. I saw an ad for the new A New Day + Vital Voices collection and I ended up ordering a few things to try one of which was this black tee that has ‘be courageous’ in cursive. Size XS fit me okay but I didn’t like how thin the tee was and worry that it may not last beyond a few wears before getting mysterious tiny holes. I wish they made this tee in white with black cursive and in a more substantial fabric. 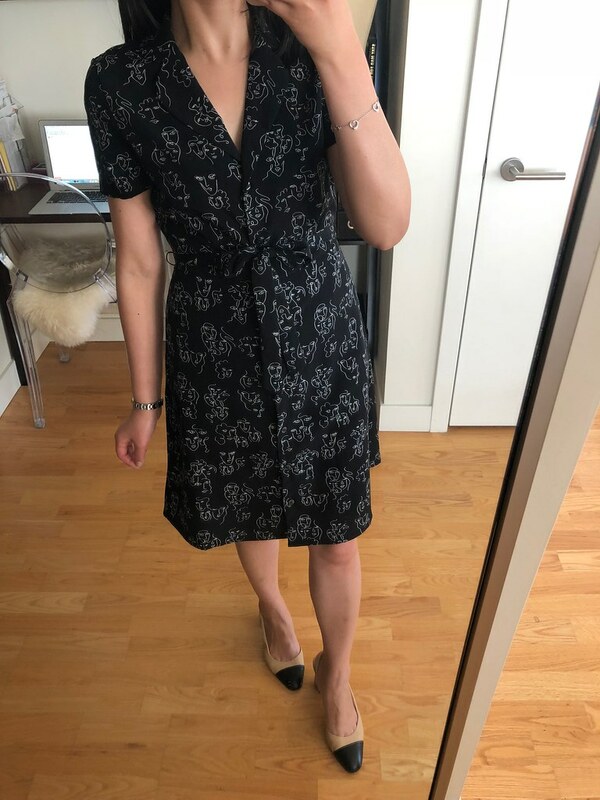 I was intrigued by the doodle face print of this shirtdress so I ordered it to try. Size XS fits me okay but it’s a bit loose fitting on my smaller chest and waist (I tied the bow sash extra tight to give my waist some definition). The dress has pockets but when you put your hands in the pockets it can feel a bit snug at the hips. The measurements of size XS are: 34″ bust, 28″ waist, 36″ total length. 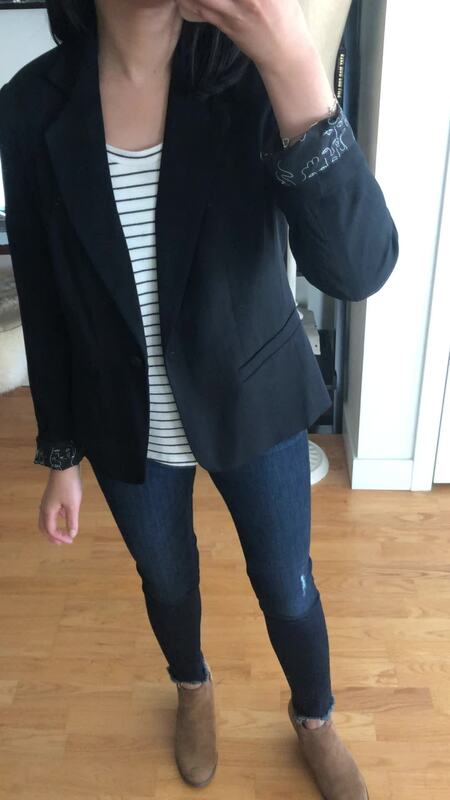 I was curious about this blazer so I ordered it to try but size XS was too loose on me. Size XS measurements are as follows: 23.75″ sleeve length, 36″ chest (pit to pit), 23.75″ front length. 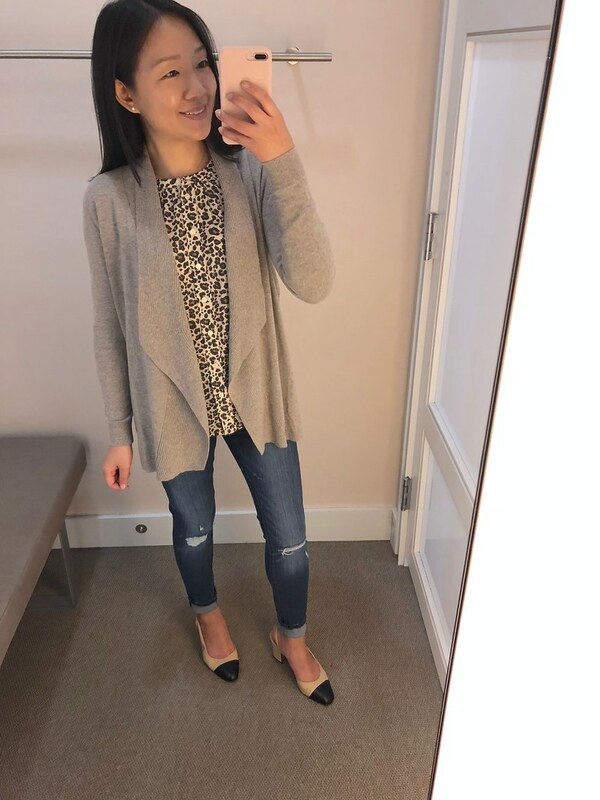 I wish Target carried more petite friendly styles or size XXS because I personally never have much luck with the sizing for any of their collaborations/collections. Lastly, I ordered this little scarf but I haven’t figured out a way to use it yet but I cut the tags off so I’m forced to keep it. I like the abstract doodles and I bought this little scarf ring so I’ll try to figure out a way to tie it along with my other silk scarves that I’ve neglected. The scarf ring actually reminded me to check out MaiTai’s scarf tying tutorials again. Hi Jess! When you do a partial return after using a reward card, in the past for me, they reward has stayed applied as long as the remaining balance after you return items was greater then the amount of the reward you used. If you returned everything, you unfortunately lose the reward altogether, which I don't think is right, and I should have been stronger in asking for it back when that happened to me. Again, this was several months ago, so the policy may have changed since then, but that's what happened to me in the past. Thanks for taking the time to share your experience @leesooim! DId you see the other two replies below? Next time you should ask for a manager so that you can get your rewards back since it is considered a form of payment. I remember ever since I bought a dress a few years ago the same experience you explained happened to me in-store so I had stopped using my rewards towards a purchase unless I was sure I was keeping it. I've often use my rewards towards my mom's picks since I know she tries on the items first and she only asks for things she really loves. My experience is a little different when doing a return with a reward, so maybe it depends on the store or sales person. If I bought something in store, it comes back on a gift card (and occasionally this is the case with an online purchase). If I bought something online, normally the return automatically goes back to the credit card (no swiping), but when using a reward, it makes me swipe the credit card. The entire amount, including my reward, goes back to the credit card. I've done this many times and never worry about my reward because it either goes back on the card or comes back in a gift card. Thank you for sharing your in store versus online experience purchasing/returning with your rewards! That's very reassuring and I really appreciate the distinction you so clearly noted. I often end up ordering online since my size or petites is online only so it sounds like online returns in store is seamless and a partial or full rewards amount will go back onto your credit card. That is how I hoped the process would work! I have returned many items I purchase with a reward. The amount I used always goes back onto my Loft card. So, if I purchased several items using a $20 reward, and let’s say I returned an item where $7 of the reward paid for it, I didn’t lose that $7, it was returned to my Loft card. I’ve also received the whole $20 back on my card when returning a purchase in which I was not keeping any of the items yet used a reward to pay. Thanks for your sharing your experience @Jacquelyn! This sounds like what @anonymous described above so I'm relieved to hear this from the both of you. A few years ago I used my LOFT rewards on a full-price dress I purchased in store (I was trying to secure my size which turned out to be unnecessary since I recall the dress wasn't a best seller). I later changed my mind about (I needed it in a different size) and I had used a $60 rewards towards a $80+ in purchase. I remember I only got $20 back and not the rewards I also used so it was VERY upsetting to say the least. I don't know why I didn't ask about it further but now in hindsight I should have spoken up and asked for assistance from a manager. Thanks so much, Lilly! I hope you find what you're looking for and I'll look forward to your picks since I always discover new things to love from you! Mine didn't bag out but I just sized up more than I should have. I didn't know that the sleeves are still loose even in the smallest size (XXSP) which I received in my new blog post.